In the judgment in the recent Supreme Court hearing on the retention by the police of data on the Brighton protester John Catt, one of the panel of judges, Lord Sumption insisted that records on alleged ‘domestic extremists’ were kept ‘in accordance with the law’ because “with limited exceptions relating mainly to current investigations or operations, any personal data in the possession of the police can be accessed by the subject by a request under the Data Protection Act”. Netpol believes this reflects an entirely sheltered view of the problems anyone with a reasonable expectation they have been subject to police surveillance will face when trying to prise information out of the police. So how true is it in practice? In May 2014, we highlighted how the majority of activists who have made subject access requests have been forced to wait far longer than the statutory maximum of 40 days for a response. We also accused the Metropolitan Police of delaying tactics and of encouraging individuals to withdraw personal data requests so it can clear a backlog of disclosure applications. At the time we wondered if the Met have decided to disclose as little as possible until after the Supreme Court had reached its decision. However, it has now adopted a new way of blocking requests. One activist who submitted a subject access request has been told that it is a ‘speculative search’, and that ”the provisions in the Data Protection Act 1998 are not intended to permit a subject to conduct a ‘speculative search’ of a data controller’s records”. This is the Kafkaesque position we have arrived at. It is impossible to know for certain whether a secret database holds data about you, so you can only speculate that your involvement in protests means it is possible. However, submitting a request without evidence that you are in fact on the database is a “speculative search.” To make matters worse, advice from the Information Commissioner’s Office yesterday suggested providing evidence of your participation in protests, to show that your request is not simply based on unreasonable assumptions or guesswork. That’s correct: in order to find out if the police hold data about your participation in political protest, you are expected to tell the police all about your participation in political protest. It is already complicated enough making a subject access request, with names of surveillance units and databases often changing. 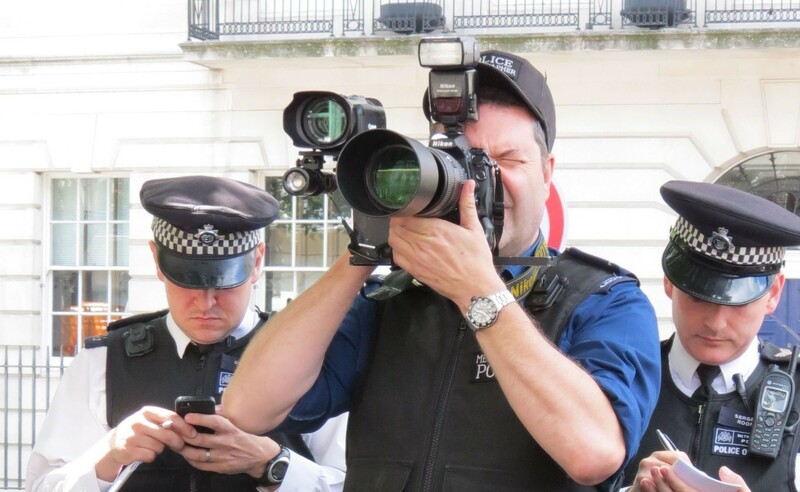 Recent weeks have shown that even the powerful, like Members of Parliament, struggle with the wall of silence that the Metropolitan Police has erected around its surveillance activities. However, we also know that in most cases, data on activists has been gathered overtly rather than by undercover officers, by Forward Intelligence Teams at protests and by trawling social media. What is just as important, from our experience, is understanding what wildly inaccurate inferences may have been reached and recorded from this data about so-called “domestic extremism”. Our advice remains the same: make a request, chose how much and how little information you are prepared to offer about particular protest movements or activities you have participated in and, if you receive correspondence attempting to stall or obstruct your subject access request, challenge it and say you will take it further to the Information Commissioner’s Office – and then let us know. Lord Sumption also said in his judgment on the Catt case that it is enough for the rules governing access to personal data to “operate within a framework of law”, as long as any discretion exercised is “reasonably predictable”. In our view, the practicalities of obtaining data held on alleged “domestic extremists” shows the opposite is true. It is impossible to predict what excuse the Metropolitan Police will come up with next. To find out more about making a Data Protection Subject Access Request, check out our guidance. contact RT for an interview .. Spread the love..
100 families have left the UK because of threats from social services to have their children removed after changes in the child act in 2011.. these same families have had follow up by irish social services and they got the all clear?? the UK is getting very scary ..
its not too encouraging for those of us that definately know that they are on such a database.. its obvious that the military security runs the uk.. first Assange, then the guardian over snowden.. attacking bloggers and trying to shut down all forms of dissent.. JTRIG warriors attacking social media ..
legal aid refused and the confiscation of your property if you lose a case (recent change) and the closing of the borders to OUTBOUND travellers at ports (maybe to stop the families running to ireland to stop having their kids removed because they have learning difficulties..
A blogger has been given a lifetime ban on talking about a certain subject after a year of imprisonment.. UK Column were attacked by ATVOD (even though Leveson promised that bloggers and online grouups would be left alone) Chris Spivey looks like he was set up and is being harrassed .. Chris Busby has had his evidence of nuclear health effects made top secret to protect the nuclear power companies and the MOD.. Other independent scientists and groups are also been targetted for various types of “Disruption (ref Snoden and JTRIG).. And of course last year NETPOLs own website was hacked and links to solicitors and FB didnt work.. 2000 journalists and at least as many computer server technicians.. Whats/who is next? Any one geting worried yet?